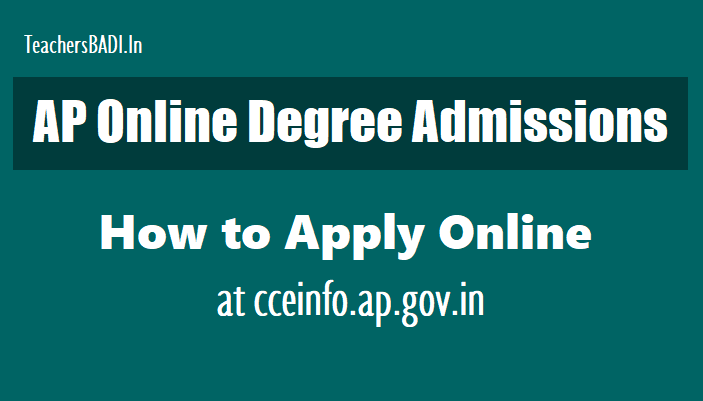 AP Online Degree Admissions 2018, How to apply Online at cceinfo.ap.gov.in. AP Degree Admissions Online Application Form: Students who want to join the Government Degree Colleges do not have to apply in general way. Online applications to be submitted through online mode. Students who want to study for the Degree first year for 2018-19, they should apply through new method. Students who want to admit into the Government Degree and Aided Colleges have to apply in your Mee Seva service centers. The government has created an APSAMS (Andhra Pradesh Academic Management System) web portal. Students based on this portal will apply at www.apcce.gov.in. In this application, the students will submit their details, what college they are joining, and what category is included in the comprehensive information. Students should provide comprehensive information in online mode. Applicants must submit the online applications as part of digital process. The applicant will pay Rs 50/- per application in Meeseva. The Challan can be downloaded in the last step of the application process or an e-mail attachment. Applicant must carry printout to nearest MeeSeva center to pay the application fee along with After printing the Meeseva Challan, take the printout and go to nearest Meeseva centre and pay the fee and keep the copy of the Challan with you. If anybody is not paying the Meeseva Challan then they are not eligible to participate in the online admission and seats will not be allocated. 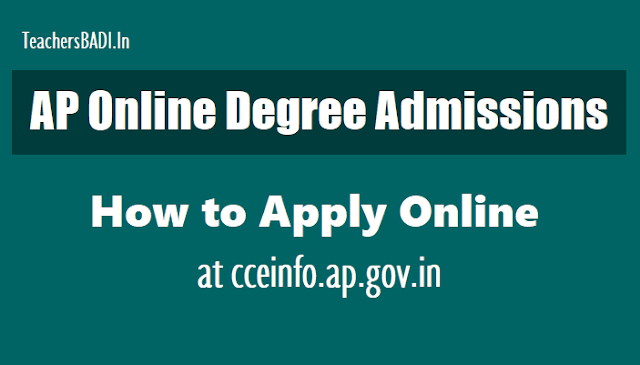 Visit the Higher Education Department website www.cceinfo.ap.gov.in , and click on the Online Application Form in its home page. You may also go through the video instruction regarding filling up of the CAF before you start the process of filling in. Now fill-up the CAF Common Application Form online on the computer screen. Upload your recent passport size colour photograph and signature image in the space provided for the same. 3. Enter Your Intermediate / (+2) Hallticket Number. 4. Intermediate Year of Passing. 5. Select Your Date of Birth. 6. Enter Your Full Name as in SSC Certificate. 1. Candidates can apply to any of the Government and Aided Degree Colleges of the State in one form. An applicant has to fill it up ONLINE by logging on to the website of Higher Education Department, Government of Andhra Pradesh www.cceinfo.ap.gov.in. An applicant can exercise up to five choices of college & stream in order of preferences where one would like to study. Applicants being passed qualifying examination from any Board, have to fill in all necessary fields of their own. 2. Candidates will have to apply ONLINE for a maximum of FIVE options through www.dheap.in by filling up required personal and academic details, choices of different colleges and streams in order of preference. After submitting the Common Application Form, the applicant should take printouts of the computer generated application form and attach the supporting documents as per the check list and be ready to submit while he/she got selected in a college. 3. Computer generates MeeSeva challan for application Fee. The applicants are requested to take printout of the challan and pay the fee at the nearest MeeSeva. Only fee paid applications are eligible for further process of admission. If applicant forgot to take print of an application or MeeSeva challan, he/she should log-in back to SAMS portal and take printout or login to their registered E-mail and get printout which was sent to their registered E-mail. 4. While admission, College can accept/reject applicant’s CAF Common Application Form after scrutiny. If the college accepts the CAF of a student, he/she should pay the fee and get the admission. If college rejects any student for any valid reason, he/she is not eligible to join in that college.